Australian shoppers are increasingly interested in where their food comes from. Thanks to our new Follow us to the Farm initiative, you can follow ALDI's frozen berries on their journey from the farm to you. Our informative video transports you to the coastal regions of Chile and takes you behind the scenes of our berry farming process. 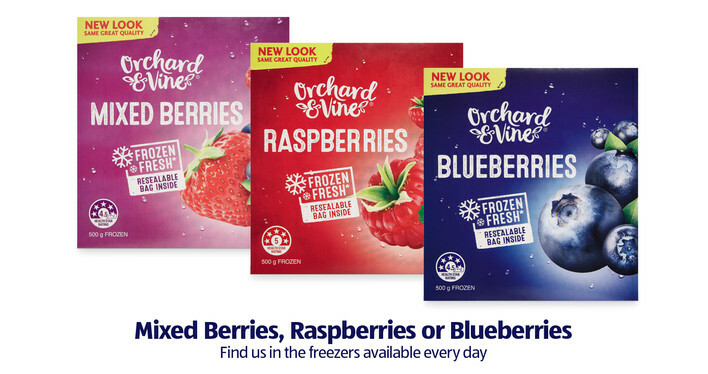 Every time you pick up a box of Orchard & Vine® frozen berries you can be confident that you are buying a delicious and safe product the whole family can enjoy. So where do ALDI's frozen berries come from? Our frozen berries are sourced from over 130 hectares of farming land nestled along the coast of Chile, in South America. The growing regions have been carefully selected for their rich soil and good climate. This coastal region is also an ideal growing base due to its geographical isolation and extremely strict customs policies. Berry farming in this region is often a family affair, with knowledge passed on from generation to generation. To our growers it is not only a way to make money – it is a passion and a way of life. ALDI frozen berries are grown, harvested and shipped with the highest standard of care possible, and comply with our rigorous food safety standards. They are frozen within 24 hours of harvesting, which locks in both nutrition and flavour. Our Global Food Safety Program has been developed from decades of research, consumer feedback and close cooperation with food safety experts as well as state, federal and international regulatory agencies. It is founded on the principles of Good Agriculture Practices (GAPs) established by the United States Food and Drug Administration (FDA) and reinforced through education, laboratory assays and annual third party audits. What is SAG and GAP? Our farmers are registered and certified with SAG (Servicio Agricola y Ganadero), which translates to Agriculture and Livestock Service. SAG's role is to set clear standards for how farms are managed, and ensure these standards are met by monitoring and auditing. SAG certified farms are also issued a unique code for their farms, known as GAP (Good Agricultural Practices). This relates to the ongoing training of staff best practice every day. BRC stands for British Retail Consortium. The BRC tick on our berries is another assurance that you are buying a safe and high-quality product. BRC is the leading trade association for UK retailing, now recognised as a global standard for best manufacturing practices. Like SAG, BRC inspectors provide strict protocols for managing facilities. They will also physically carry out inspections and audits, to ensure their high standards are being met at all times. How do they taste so great? Superior flavour and quality is achieved by using traditional, natural grafting techniques, to develop berries that are resistant to pests whilst never genetically modified or subjected to irradiation. The local farming community has developed these methods over the years. They are committed to respecting the land and ensuring clean water, good soil nutrition and a top quality product, so that the land can be passed on to future generations.